With this release, IT can now deliver RDS hosted applications alongside virtual desktops through a single platform. 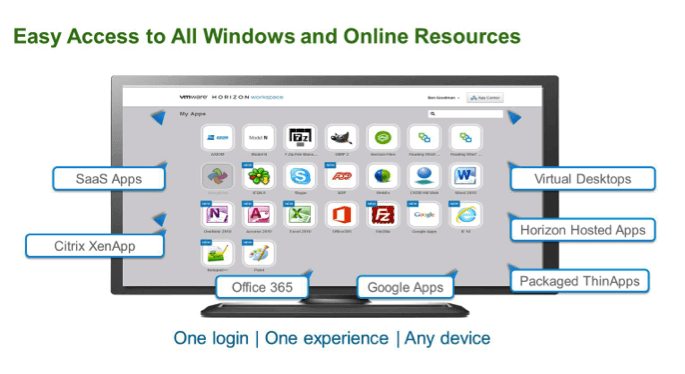 And these desktops and applications—inclusive of packaged ThinApp, SaaS apps, RDS hosted apps and even Citrix XenApp applications—can all be accessed by end-users through a unified workspace. VMware has been hard at work to ensure that end-user performance with PCoIP is better than ever before. In fact, with Horizon 6, new bandwidth management enhancements and changes to the PCoIP default values improve user experience over wireless networks and reduce bandwidth usage by up to 30% out of the box. But this release is not just about apps and making end-user access a whole lot easier, it’s also about ensuring that IT organizations everywhere can streamline and automate desktop and application management and ultimately drive down costs. To help with this—Horizon 6 includes Mirage—which takes a layered approach to image management ensuring that IT can simply patch, update and manage images for physical, full-clone virtual and even BYO PCs. Horizon 6 also ensures that it is easier to set up desktops—with the Horizon vCenter Orchestrator (vCO) plug-in. By using this plug-in with vCloud Automation Center (vCAC) –IT can approve and provide self-service to end-user requests for applications and desktops and end-users can refresh and recycle their desktops as well. Delegated adminstrators can also do these things on behalf of end-users or simply manage entitlements and assignments for specific pools. So if you have end-users and admins across multiple locations—you now have the ability to empower them without losing control along the way. VMware is also making it easier to monitor virtual desktop environments to ensure end-users have the best possible user experience. With Horizon 6, vCenter Operations Manager for Horizon now supports monitoring for both desktops and hosted RDS sessions and applications. This allows organizations to monitor all Horizon components including desktops and apps, the network, your virtualization stack, and your host and application servers. Now many customers need to provide five nines of availability to their end-users—particularly in healthcare, financial services, retail and government. And when a desktop that resides on a server in the datacenter goes down—it often means that end-user goes down too—and that employee may as well go and watch the World Cup because they can’t get to the apps and data they need to get their job done. With Horizon 6—we have introduced a Cloud Pod Architecture that allows organizations to scale Horizon 6 across multiple datacenter and sites. This architecture supports an active-active configuration to ensure high availability–so if an end-user’s desktop in Site A goes down, they can easily be entitled to another desktop in Site B without any downtime. All of these management enhancements will help drive down the day to day costs of supporting end-users. But how does Horizon 6 help you maximize the investments in VMware you have already made? (And what I am really talking about here is those investments in vSphere and thesoftware defined datacenter). Well for starters–Horizon 6 comes with vSphere and leverages vCenter to manage and set up pools of users—making it a no-brainer for anyone on vSphere looking to take advantage of desktop and application virtualization in their environment. Customers can leverage vSphere with Horizon 6 to deliver great 3D graphics inclusive of software rendered graphics, shared graphics acceleration and dedicated graphics. This is not new. But Horizon 6 isn’t just about optimizing workloads for vSphere-we also have optimized our virtual desktops and apps for VMware Virtual SAN. And Virtual SAN along with vSphere and vCenter all come bundled with Horizon 6. With Virtual SAN, organizations can now use local storage and get the performance you’d expect to see from an all-SSD storage system. Not only will this save you money—but it is also makes it a lot easier to manage. It literally takes 3 clicks to install Virtual SAN through the vSphere web client. What’s more, once you have this set up—you no longer need to manage it on a day to day basis. This goes a long way in making storage management actually manageable.With Virtual SAN, organizations can now use local storage and get the performance you’d expect to see from an all-SSD storage system. Not only will this save you money—but it is also makes it a lot easier to manage. It literally takes 3 clicks to install Virtual SAN through the vSphere web client. What’s more, once you have this set up—you no longer need to manage it on a day to day basis. This goes a long way in making storage management actually manageable.